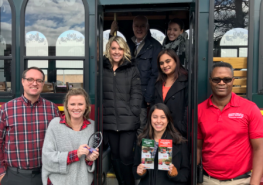 Chicago Trolley & Double Decker Co.was recognized as the 2017 Marketer of the Year by CTM Media Group Inc., one of North America's largest distributors of visitor and tourism information. The "Marketer of the Year" award is presented to the company that most effectively targets the in-market visitor. "The award is well-deserved," stated Diane Salvo, Director of Marketing, CTM Media Group. "As advocates of effective visitor out of home marketing campaigns, we want to celebrate our clients and their successful marketing." "When you look at Chicago Trolley & Double Decker's marketing campaign, it's clear they understand the value of brand awareness for the in-market visitor. Particularly in Chicago, targeting heavy traffic areas such as Downtown Hotels, Navy Pier, McCormick Place, Union Station, and Midway Airport are essential," added Jessica Husted, CTM's Media Consultant. Their commitment to creative campaigns highlighting their Hop On Hop Off year-round tours as well as their seasonal Holiday Lights Tour promotion in CTM's core brochure program have earned them high pick up rates well over 100,000 in just a single year. Their strategic initiative to be top of mind with today's travelers have earned them more than 5.5 million digital signage impressions on local area touchscreens and their creative die-cut display signage campaign keeps their brand visible in the minds of Chicago visitors, tourists and out-of-town guests who are looking for what to do next. "CTM has been a great partner. From our brochure distribution to the digital touch screens and display signage seen around the city, CTM plays a key role in the marketing of Chicago Trolley & Double Decker Co. CTM has been fantastic in putting together the right packages that work for us," says Sara Conway - Chicago Trolley & Double Decker Co.
For more information, as well as to learn more about CTM's visitor marketing advertising opportunities, visit www.ctmmediagroup.com or call 800.888.2974. About CTM Media Group Inc.
CTM Media Group Inc. is owned and operated by IDW Media Holdings Inc. (OTC Pink Markets: IDWM). CTM Media Group Inc. is one of the largest distributors of visitor and tourism information in North America serving 19,000 locations and reaching 300 million visitors. More than 3,000 clients consider CTM an integral part of their marketing strategy – many of them for more than 25 years. CTM partners with hotels, attractions, convention centers, transportation centers, sporting goods shops, and more to put their clients directly in front of visitors - right at the moment when they're making decisions about what to do next. ATTN: Restaurants…Hungry Tourists Are Looking For You!